Meaningful Play is now complete. 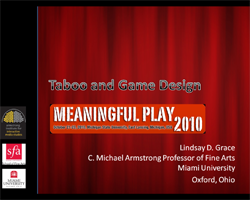 I’ve posted my panel presentations for anyone interested in Taboo Game Design or Heuristics for Teaching Meaning. The presentations were generally received well and it sounds like Taboo Game Design will be converted to a paper. Generally, the conference was great. Some presentations were stronger than others, but that’s to be expected. I especially enjoyed Robin’s preview of That Game Company’s next project – not because it was particularly revealing, but because it’s really great to see people embracing alternate game mechanics. The presentation was entertaining and inspiring, more than it was informative or academic. 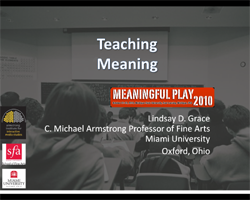 Meaningful play is a wide ranging conference. There were presentations by the usual suspects in computer science, design and communications. But there were also presentations by sociologists and media studies folk. The key theme at this year’s event seems to be the dilemma of divorcing the term serious play from its antiquated connotations. Much of the meaning at this conference included empathy design, creating emotion in games and the general acceptance that play is meaningful, the challenge is how best to employ that meaning. It sounds like most of the people who went were looking for some form of direction. I encountered faculty in games looking for ideas for curriculum design, designers looking for inspiration, game companies looking for representation and way finding, and academics looking to exchange ideas. Overall, I think everyone got at least some of what they came for. From my experience with other conferences, I’d say Meaningful Play has a great formula. Where Games for Change is a bit more formal and linear, the multiple tracks and range of presentation styles at Meaningful Play allows it be as formal, or informal as an attendee needs. It’s not a full day of being talked at, there are moments (especially in panels and roundtables) to talk with people. There were also multiple social events at night, so it was easy to talk casually. Overall, a good thumbs up conference. I hope to see it grow in the future. In other news, Gambit MIT swept the game awards. For a few attendees this brings up an interesting point. How can we better evaluate games at showcases and exhibitions? Gambit clearly has a good formula, as does Digipen and others who have consistent representation among the top ranks. Yet, there’s something off about trying to evaluate a Gambit game against solo developers like Jake Elliot (who showed a House in California). Not only is there the dilemma of comparing 11-person teams to 1 person teams, there’s also the environment in which the games are played. This year’s Meaningful Play game exhibit was a little hotter, and a lot more dense than the 2008 event. That’s a great environment for high energy games, but not for reflective, slow paced games. I’d put some of my personal favorites in the category of games that just don’t work in an arcade environment. What’s even more interesting is that often the environment in which games were originally judges is very different than the environment in which they are judged during the show. So for example, judges evaluating games in their quiet offices is not the same as judges evaluating games in the raucous environment of an exhibition or showcase. I don’t really have a solution for this, but I do think it’s worth considering. This question is particularly important to games that aren’t about twitch response, but require a more reflective, perhaps even meditative experience. The current model seems biased toward adrenaline and community, not solitary and soothing. C’est La Vie. Either way, I can’t wait for the next Meaningful Play. Until, then, keep making meaning.